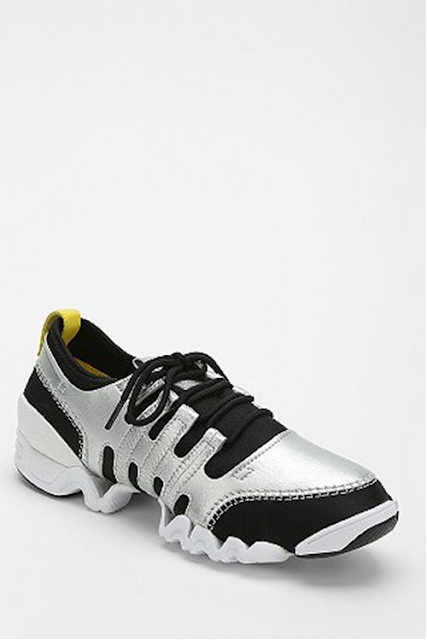 Today's So Shoe Me is the SLVR Running Sneaker by Adidas, $150, available at Urban Outfitters. This fall it's all about the signature sneaker and this sleek silver style by Adidas mixes on trend details with heightened performance. The lightweight materials and liquid silver upper will have you running at the speed of light whether you're competing on the track or at the grocery store. Pair these squiggly soled sneakers with a cheeky Nike inspired tee and black track pants for an easy athletic vibe. So Shoe Me a pair of futuristic sneakers that offer high performance and lightweight materials for a high fashion sneaker that offers a competitive edge.